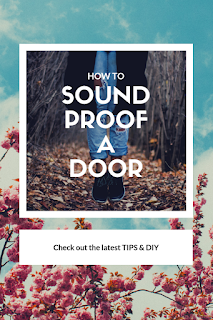 Since you have landed on this page, I am sure you are looking for Tips & Tricks to soundproof a door. Soundproofing is a grey area. There are lots of products and techniques available in the market for this purpose. The thing that really matters is the knowledge regarding the techniques that need to be applied and the products that need to be selected. In this post, we will be covering the tips and tricks that we have been applying over several years and also, the products that are really good for someone who is starting or new to the soundproofing domain. Especially in America and Canada, the homeowners are so enthusiastic and passionate about the soundproofing project. They will spend time and money on the soundproofing project but unfortunately, due to the poor knowledge on the subject, they couldn't succeed. When people are planning to soundproof their apartment or room, they invest a lot of money on soundproofing floor, ceiling, windows, and walls. I don't know why the doors aren't given importance. If you are the one who searches on the internet before taking any decision, then you will be aware of the fact that the windows and doors play when it comes to soundproofing. Most of the noises and unwanted sounds come from doors and windows. The first thing that you need to do is to soundproof your door. I have helped quite a few clients in soundproofing the door and, today I will discuss all my experience. I have tried a lot of techniques. Needless to say, few were successful and the rest were disasters. Today I will take you through all the methods that have been successful over a period of time. To start with, sealing the gaps and cracks is very important as these are the main culprits in most of the cases. Most of the doors have cracks and ignoring it can lead to numerous complications. Trust me, it's good to spend a lot of money and think that the soundproofing will be done but it doesn't work that way. Our motive is to help you spend a minimum amount of money and get the best result. We are gonna discuss some of the difficulty that you will face while sealing the gaps and how to overcome these difficulties. First and foremost, you will have to locate the small and the big cracks in the door. Sometimes it's really difficult to locate the smaller ones, isn't it? To locate the smallest of the cracks and holes, you need to switch off the light in the room and ask someone to stand outside the room with some source of light. You will find the light rays entering the dark room through the crack and thus, you can start immediately working on it. Sealing these gaps aren't only easy but economical also. Though there is a wide range of products available still I recommend this insulating sealant. The reason why I recommend this sealant is the airtight property. This unique airtight property gives it an upper edge over its competitor. Another interesting thing about this product is that it is paintable, that is, you can paint it to the same color as your door. However, this product isn't effective if the gap is less than an inch. I'll suggest you to try this one. Once you are have sealed the cracks and holes, you will feel the difference and, the best part is you have taken your first step in soundproofing a doorway. I hope you will be aware of the weatherstripping tape, it has multiple uses. If you own a garage, then definitely you would have used it on the bottom of garage doors, isn't it? Even before I planned to be a soundproof consultant, I found one of my close friend using this weatherstripping for soundproofing the doors of his apartment. This high-density foam tape is shock-absorbing, sound and heat insulation, anti-skidding and oil resistant. Though I have suggested some other weatherstripping tapes to my clients still I found this foam tape the best in the market. First of all, clean the surface where you want to place the weatherstripping tape. Mark the same height as the place you need, then cut the excess tape. Now, peel off the backing film. Apply the seal tape to the place you need. Important Tip: It is very important to get enough compression while setting up the tape. Further, the compression will ensure that the airtight seal is formed between the door and the tape. Remember, it is the seal that blocks out the sound. Definitely, keeping fun weatherstripping is a good alternative to above-mentioned tape. Though it's expensive still it serves the purpose successfully. This tape can be used for multiple purposes such as waterproof, windproof, excellent aging resistance. I suggest you use it if your apartment has sliding doors, closet doors or security doors. This tape has a unique grid adhesive backing- stick firmly, give your doors long time protection. For the optimum output, I would suggest you, reinforce the steps you have taken so far by using a suitable soundproof blanket. I have written a detailed article on soundproof blankets, you can read it here. The soundproof blankets are made of fiberglass, a sound absorber material, and is capable of absorbing all the unwanted noise. They are easy to install. You simply need to hang them onto the hooks at the back of the door. Depending upon your requirement, you can put them up or down. The only thing you may not like about this product is that it doesn't have any elegant appeal. They may not be the one, you are looking to keep in your dining hall or television room. You may use these soundproof blankets for such doors where aesthetic appeal isn't needed. Till now, we have found a solution for small cracks and holes in the doors. Moving further, we will talk about the biggest gap, that is, space between the door and the floor. I hope you will agree that most of the sound will enter the room through this gap. I will suggest you to use door sweep to overcome this problem. Though the door sweep may take a couple of hours for installation still it's worth to use it. The door sweep is made up of sound absorbing materials and it seals the space between the door and the floor when the door is closed. If you are planning to buy door sweep, then you need to be well versed about its installation process. The process is tedious, first, you will have to drill and then, screw the sweep fastener into the door. Allow me to throw some light on some other advantage of using door sweep. It prevents the dust as well as insects from entering the room. At the same time, you can keep your room cold or hot because of the energy efficient properties of the door sweep. I will recommend you to use this door sweep, it not only fills the door up to 36 inches wide but also, seals gap up to 3/4 inches high between bottom of the door and threshold. Placing a rug near the doorway can definitely help in reducing the sound coming from other room. I suggest this product to those who are not only looking for sound dampening product but also, looking for the product that can add a visual look to the room. The heavy Rugs are great at absorbing echoes. The noise that bounces the doorway can be drastically reduced by placing the rug on either side of the doorway. It will be totally wrong to say that RUG will do wonders. In fact, it's only good at reducing the effect of the sound reflecting from the hard surface. Personally, I have tried quite a few types of RUG but unfortunately, the effectiveness of most of them was below my expectation. I will suggest you this RUG to buy, it will give you an incredibly soft feeling underfoot. You can choose from a variety of colors and designs to give your room an elegant look. It is made of the thick polypropylene fibers to ensure a durable, long-lasting, and virtually non-shedding rug. This RUG works best with the contemporary, transitional, casual, and modern style of decor. Soundproof curtains act as a great sound absorber. These curtains are made of thick sound absorbing materials that drastically dampen the impact of the sound. 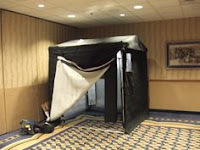 It is advisable to put a soundproof curtain on the soundproofing doorway. 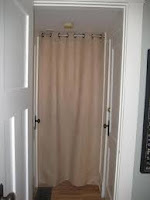 The installation of the soundproof curtain is very simple and easy. The first thing that you need to do is to install curtain frames above door rods. After installing the rod, you can use drapes similar to the windows. Some other benefits of soundproof curtains are blocking light, trapping heat etc. I have written a detailed article on the best soundproof curtains, the article will help you to decide on the soundproof curtain. 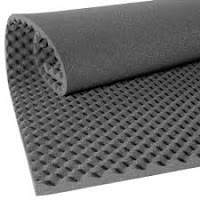 In case, you find soundproofing curtains an expensive option, then you can try sound absorbing foam panels. These soundproof panels absorb sound and thus, reduces the sound wave passing through it, that is, it increases the air resistance by reducing the amplitude of the sound waves. Similar to the soundproof blankets, you need to hang the foam panels on your door. If you are planning to buy soundproof panels, then I will suggest you to try command strips, it will NOT only safeguard your door but also, prevent it from getting damaged due to your nails. The only downside of these panels is that they aren't visually appealing. If you are looking for a sound absorbing panel which is visually appealing, then definitely you can give a try to the acoustical panels. The acoustic panels NOT only perform better than the foam panels but are also more aesthetical. Mass loaded vinyl is a high-density thick material that acts as a great barrier to sound. The mass loaded vinyl can be a great solution when it comes to restricting the hallway sound from entering the study room. The installation process is simple and less time-consuming. You need to buy the loaded vinyl, then cut it according to the size of your door and finally, attach it to the doorway. I will suggest you, use a double layer of the mass loaded vinyl for optimum result. It's important to use heavy adhesive. If you are tight on your budget, then you shouldn't go for this option. Though there are many types of mass loaded vinyl available in the market still I will recommend you to go with this product. The most important thing is to find the source of the noise. For example, if the source of noise is something like television, then you can use paintings, furniture, bookshelves etc in the hallway to reduce the intensity of the noise. Remember, a doorway is just a path for the noise. It's always advisable to dampen the sound on another side of the door. You can even try RUG, it can be of great help. If you have tried all the methods and still feels that you aren't satisfied with the soundproofing of the door, then you can change the door completely. If the door which you are planning to soundproof is hollow, then you will have to replace it because the hollow doors are a great amplifier of the sound waves. I totally agree of the fact that this method of soundproofing a door is most expensive of all the options discussed till now but at times, we need to suggest this option to our clients because of their specific requirements. The best thing about the solid wooden doors is that they dampen the noise rather than amplifying it. If you are using this method, then I can assure you that you can easily feel the difference. I will recommend you to hire a professional to install the new door. If you are confident enough that you can do it, then you can also try installing it. If you are tight on the budget, then you should try a drywall on the hollow doors. The drywall is made of sound absorbing materials and thus, reduces the noise that goes through it. Before we move further, allow me to share some of the mind boggling article of this blog. I hope you will appreciate my effort for this post. It's a humble request please share the post in case you feel it can help others. At the same time, please let us know the tips and tricks you use to soundproof a door. 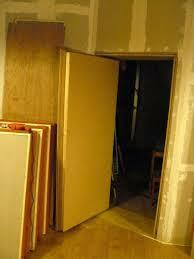 Definitely, soundproofing a door can be cheap as well as expensive depending upon the method you choose. I will suggest you to get your room evaluated by a professional if you are looking for soundproofing a room or entire apartment. In case you are looking for soundproofing a doorway only, then the method shared in this post are the most updated ones. If you are looking for some cheap method which can give a decent soundproofing, then should try weatherstripping adhesive tapes. As said earlier also, if you are looking to reduce noise to a significant level, then better get the room evaluated first and then count on the option available. I will also suggest you to spend some time, money, and of course your energy in the entire process. Though all the method mentioned above will reduce the noise still I will suggest you to go with two of the methods at one go. We have mentioned in the start of the post that all the methods have used by our clients and thus, I can assure you of the success. 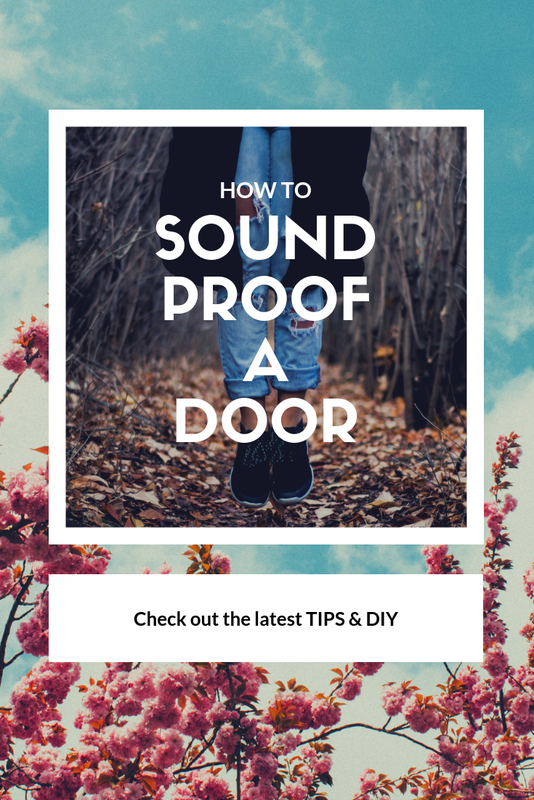 Last but not least, the best method for soundproofing a door for anyone can be the one that serves the purpose without having a huge dig on the pocket.